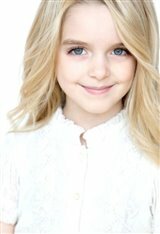 Mckenna Grace has always wanted to be an actress, citing Shirley Temple as an inspiration in an interview with Ed Symkus for More Content Now: "I love Shirley Temple, and I've always wanted to be like Shirley Temple." Like Shirley Temple, the young American actress began her career at a young age when she took on a recurring role on the Disney XD network kid's show Crash & Bernstein in 2012, playing the part of the Bernstein's youngest daughter, Jasmine. Mckenna would act on the show for the next two years. Starting her career at such a young age as the only actor in her family, Mckenna cites her mother as the person who gave her the best advice: "Well, my mom told me if you do your best, then you know that you did all you could have done, and you can do anything you put your mind to." From television, Mckenna quickly moved to the big screen starring opposite Entourage star Adrian Grenier in the 2013 post-apocalyptic feature film Goodbye World. That same year she went on to star in a film with other TV mainstays such as CSI's Matthew Gray Gubler and 2 Broke Girls' Kat Dennings in the horror/comedy Suburban Gothic . It was around this time that Mckenna landed one of her longest running roles on a series as the young Faith Newman on the popular soap opera The Young and the Restless. She would appear in the show from 2013 to 2015. During that time, the ambitious young actress would make appearances on various other popular television series such as CSI, The Vampire Diaries, and Once Upon a Time. Indeed, each passing year is an even more successful one for the young actress. In 2016 she played roles in popular films such The Angry Birds Movie and Independence Day: Resurgence , in addition to having a recurring role on the much anticipated Full House series reboot Fuller House. The success continues for this rising star in 2017, with Mckenna starring in the popular horror franchise Amityville: The Awakening as well as the film Gifted , co-starring alongside Hollywood heavyweight Chris Evans. Mckenna has also completed roles in the comedy feature How to Be a Latin Lover and the 2018 dramatic biopic I, Tonya , starring Margot Robbie, in which Mckenna plays the role of a young Tonya Harding. In an interview with the Boston Globe, Mckenna explained that this was her toughest role yet: "Physically, it was the most challenging role I've ever done before because I had to learn to ice skate, and I've never done ice skating before. I'd fall and I was all beaten up but I had to get up and keep trying." But don't think that film will remain the actress's only forte. Mckenna continues to keep her talents diverse by appearing on television star as well as film. She can be seen starring as Kiefer Sutherland's character's daughter on the hit drama series Designated Survivor. Mckenna has also not ruled out a career as a singer, saying that she loves to sing and would enjoy being in a musical. But all this contact with big names in Hollywood has not affected the young actress. She stays grounded and has a heart of gold as she often participates in charity work for organizations like A Wish for Wings as well as raising money for Cook Children’s Hospital. She also loves animals and is a proud vegetarian.